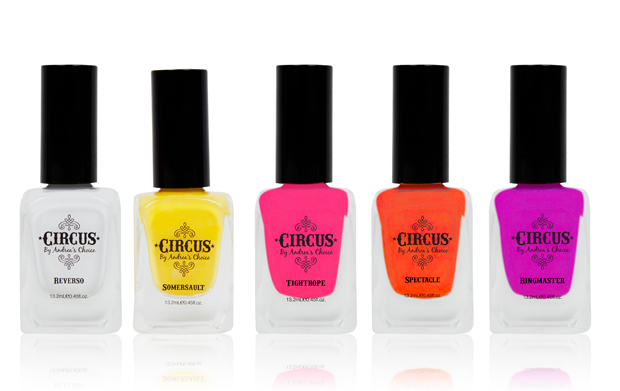 Fellow beauty guru, AndreasChoice, will be launching her own nail polish collection, Circus by Andrea's Choice, in Fall 2012! You guys know how much we love nail polish, so we'll definitely be picking these up! The colors are bright and bordering on neon which would be perfect for summer. It's too bad we'll have to wait until the fall to play with these fun colors. 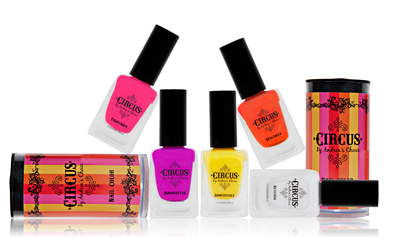 There are five polishes in the collection and they're all named following the circus theme. 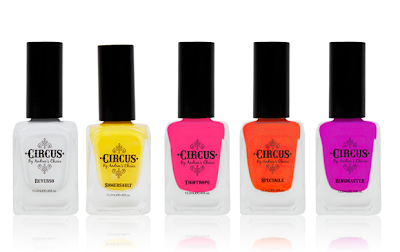 The Circus Collection includes Reverso, Ringmaster, Spectacle, Somersault, and Tightrope. All of the polishes are vegan, cruelty free, and free of Formaldehyde, Toluene, and DBP. Which colors are you most excited to get your hands on? I got the white in my July Glam Bag! That's so exciting - it would be amazing if you girls had your own polishes too... You could call one "Roll Tide", "Sally Ann", "Tammy Lou", "Go Get You Some"... Among others! :). Thanks for all of your awesome reviews, tutorials, and DIY! I got mine in my July Glam bag, I received they yellow one! I used it as an accent nail, the color was good. if I remember right it was really liquidy and it probably could have used 3 coats, but I left it at two. and It seemed to chip fairly easily. but I need to try it on all my fingers to get a real good idea on it. but first impressions I was not impressed! I got the white one and it was really, really thick. Its a nice, bright white but lasted all if two days and seemed to leave my nails really brittle even though I had s treatment on as a base. I have both the yellow and pink polishes :) While the yellow is streaky (like the majority of yellows are) the pink is lovely. One coat and it levels out really well. It dries a bit matte and is verging on neon. Can't wait to try the purple and orange once they are released!